Residency issue • Legislator insists he never stepped down. 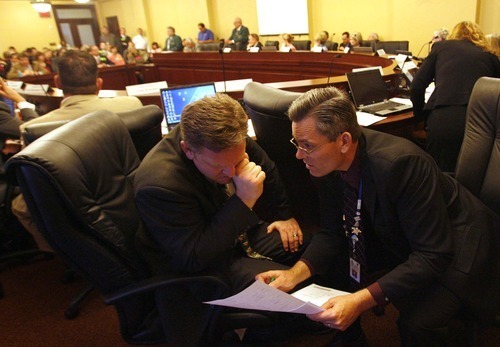 LEAH HOGSTEN | Tribune File Photo Former Rep. Craig Frank, left, and Rep. Ken Sumsion huddle during the last legislative session o AL HARTMANN | The Salt Lake Tribune Former state Rep. Craig Frank. LEAH HOGSTEN | Tribune File Photo Former Rep. Craig Frank, left, and Rep. Ken Sumsion huddle during the last legislative session on the House floor. Frank is fighting to retain his seat, disputing state maps showing he moved outside his district and is disqualified from serving. AL HARTMANN | The Salt Lake Tribune Former state Rep. Craig Frank. After announcing his own ouster from the Utah Legislature on Monday, Craig Frank is now insisting he never resigned his seat and plans to serve in the Legislature. "I am the legislator at this point. I am the duly elected representative and until I am not seated, I will perform my legislative duties," Frank said Friday. Frank said the lieutenant governor's office certified the election, nobody contested the results and he never resigned his seat. There will be a showdown, if necessary, he said, where his House colleagues will be forced to vote in public whether or not to seat him when the Legislature convenes Jan. 24. "There is an orderly process and the process is for the body of the House to not seat me," Frank said. "The process would require that this vote not be taken by secret ballot but it be taken in a public forum with the people's representatives discussing and debating the validity of one of their colleagues' right to sit with them." House Speaker Becky Lockhart declared a vacancy in the seat effective last Saturday, after it was discovered that Frank did not live in his legislative district. Due to an apparent error, the Utah County Clerk's map included the neighborhood the Franks moved into two years ago in the district. Legislative attorneys said that, because the Constitution requires a member to live in his or her district, Frank was ineligible to serve and his removal from office was automatic and self-executing. "It appears the residency requirement precludes someone who doesn't live in the district from serving in the seat," Frank said during a news conference on Monday. "My duties as a representative have been terminated." Now, Frank and his supporters are arguing the boundaries adopted by the Legislature were incorrect. Sen. John Valentine, an attorney who represents the same Cedar Hills area and is helping Frank's bid to keep his seat, said the Legislature intended the district to include all of Cedar Hills. Frank said the maps read "city boundary." But the neighborhood where the Franks built their home was annexed into the city before the maps were adopted and should have been included. If it had been, he would be eligible to serve. But the line on the official maps that the Legislature adopted for the state House, Senate and U.S. Congress are consistent and did not include the Franks' neighborhood in House District 57. The Legislature has already balked at a proposal to have the governor call a special session to adjust the boundaries to include the roughly 2,500 residents of the northern portion of Cedar Hills, 600 of whom had voted in the wrong election in 2010. 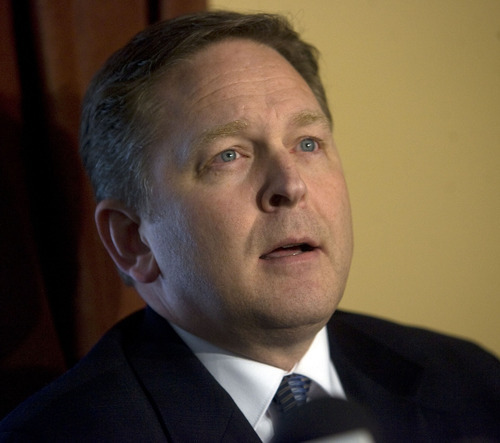 Mark Thomas, administrator of the Lieutenant Governor's Office, which supervises elections and, by law, decides disputes over political boundaries, said that nobody has asked the office for a ruling on the map. "The election happened. [Frank] was certified to hold that seat, but it's pretty clear with the maps we have from legislative research, that he lives outside the district," Thomas said. "We haven't seen any evidence to suggest otherwise." Frank's backers argue those voters would be disenfranchised if they are forced to be represented by lawmakers they didn't get to vote for. "There are a lot of people out there who are convinced that, because the vote was certified and there was no contest that I'm their representative. That's coming from quite a few constituents," Frank said. "They want me to push forward." Gov. Gary Herbert has told lawmakers and GOP officials that he doesn't plan to call a special session. His spokeswoman Friday would only say that the governor has not received a request for a special session from legislative leaders. Lockhart could not be reached for comment Friday. House Minority Leader David Litvack, D-Salt Lake City, said Republicans should proceed with picking Frank's replacement. "The facts as I understand them at this point are that Craig Frank does not live in District 57," Litvack said. "If that is fact, then Craig Frank does not constitutionally qualify to represent District 57." Taylor Oldroyd, chairman of the Utah County Republican Party, said that the party will hold an emergency meeting of its steering committee on Saturday to hear evidence from Frank and his supporters. "A person elected or appointed to the office of [state] senator or representative may not continue to serve in that office after ceasing to be a resident of the district from which elected or for which appointed."